Presented to the club in 1986 by Mrs. Doreen Evans in memory of her husband Roy. As Roy’s main interest was in the R36R class, and in view of the fact that he mostly sailed at the midweek meetings, Mrs Evans requested that one Tuesday each year be set aside on the midweek sailing programme for an R36R racing event at the conclusion of which the winner be presented with the trophy by – if possible – Mrs Evans. Mrs Evans agreed that, if at some future date the R36R class was no longer sailed by the club, the trophy could be put to some other use. 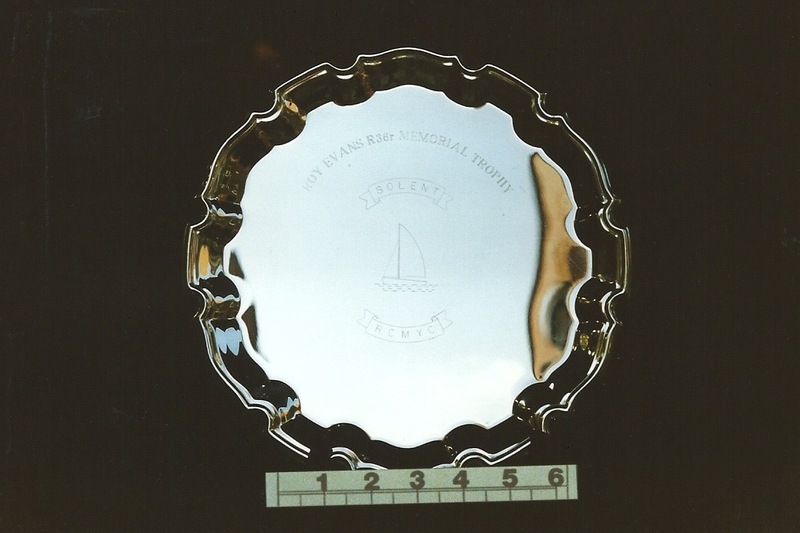 It was thought, at one time, that Mrs Evans did not wish the winners names engraved on the trophy but this was later found to be incorrect and in 1992 the trophy was engraved with the dates and names of all previous winners. The Trophy is nowadays presented to the top Solent Radio Control Model Yacht Club skipper taking part in the Metropolitan and Southern District R36R Open event.